Growing your own garlic is pretty easy, there is nothing more complicated about it than growing any other vegetable in your garden. There are two basic types of garlic, hard neck and soft neck. The type that is seen in most grocery stores is of the soft neck variety. The bulb have layers of paper-like skin surrounding the cloves. The cloves themselves are generally larger on the outside of the bulb and smaller in the center. The hard neck varieties are less common. They have little to no paper around the cloves and they usually have a single row of bulbs around the plant stalk. Hard neck varieties also send up a flower scape with tiny bulblets instead of flowers. Clipping the scape off early will increase bulb size. Both types store relatively well when handled properly. As with many plants, you will see a variety of names for the different cultivars. Finding a supplier with a good selection will help you navigate this maze of names, but never be afraid to experiment with different types, just be aware that different suppliers may have different names for the same varieties for marketing purposes. Once you settle on a variety or two that you like, it's simply a matter of saving the best cloves from the best bulbs each year for planting next year's crop. Since it's in the same family as onions, this plant also likes well drained soil rich in organic matter. When preparing the soil, mix in some well composted manure and it will reward you with large bulbs with cloves that are bursting with flavor. This versatile herb even lends itself to container gardening for those who prefer this type of gardening. Garlic is usually planted in the fall during October and November before the ground freezes. It can be planted in the spring, but the results will not be as good. Keep the bulbs together as much as possible before planting the cloves. This will help keep the cloves from drying out. When you are ready to plant, peel the paper layers back and separate the cloves. Use only the largest and best looking cloves for planting, keep whatever is left over for cooking. Plant the cloves in rows or intensively in beds or containers. Space them evenly 4-6 inches apart and 1-2 inches deep. Like any other bulb, the pointed end goes up. Water well and mulch the bed with leaves or grass clippings to protect the cloves from frost heave. That's it for now. The plants will benefit from an application of balanced fertilizer in May, but avoid fertilizers too heavy in nitrogen after that, compost tea diluted 1:10 should be fine every couple of weeks. Harvest time is when the foliage starts to turn brown. Stop watering the plants and check the bulbs when the stalks are 1/2 to 2/3 brown. Dig one up to see how it looks. 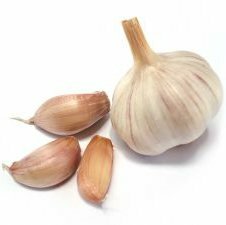 If the bulbs are full and the cloves are bulging, then it's ready to be harvested Dig them up carefully as garlic bruises easily. For best storage, the bulbs need to be properly cured. Do not rinse them off with water or leave them in the sun to dry. Rather, brush the dirt off of them lightly and bring them inside and hang them in bunches. The soft neck varieties can be braided together if you wish. Let them dry for two weeks and then they are ready for storage. If you removed the stems or have the hard neck varieties, store the bulbs in paper, not plastic bags. You are now ready to enjoy the fruits of your labors, using the freshest, most flavorful garlic from your own garden. One of our favorite ways to prepare it is making roasted garlic. The cloves caramelize and it really brings out the sweetness. Mix with butter for amazing garlic bread. It also makes great pesto when combined with the fresh basil from your garden.